Heavenly blog! : No. 664: Specialization and explanation why I consider Benny Hinn , Jan Hanvold and other Pentecostal Charismatics as dangerous for you as they really are magicians , psychics and false prophets! No. 664: Specialization and explanation why I consider Benny Hinn , Jan Hanvold and other Pentecostal Charismatics as dangerous for you as they really are magicians , psychics and false prophets! Specialization and explanation why I consider Benny Hinn , Jan Hanvold and other Pentecostal Charismatics as dangerous for you as they really are magicians , psychics and false prophets! 1 Jn . b 2 18 My child ! it is the last time : and as ye have heard that antichrist is coming, so it is and now many antichrists , whereby we know that it is the last hour. 19 They went out from us , but they were not of us : for if they had been of us , they would have continued with us : but it should be obvious that not all of us . 20 And ye have an unction from the Holy One, and know all . We live in the last few days , they have gone out from us says the apostle . They move among the Christians , but they have never been Christians and true born-again child of God , where it is obvious that Jan Hanvold , Benny Hinn , Todd Bentley , and very many other Pentecostal charismatics . Had they had complied with God's word and biblical and healthy church discipline , they had never had a nubbesjanse to deceive and mislead so many people. 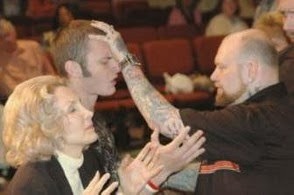 Photo of Todd Bentley who is remarried as Jan Hanvold and so many other Pentecostal Charismatics are. Notice verse 23: "And then I will declare to them, ' You have never known me. Depart from me , you who are doing lawlessness . " These people like Benny Hinn , Emanuel Minos , Jim Bakker , Jan Hanvold and countless other Pentecostal Charismatics , they have no conscience intact . 1 Tim . 1 18 This charge I commit unto thee , son Timothy , according to the earlier prophetic words of thee , that thou by them will fight the good fight , 19 as you have faith and a good conscience , it has some cast away and suffered shipwreck in the faith ; 20 Among these are Hymenaeus and Alexander , whom I have delivered unto Satan , that they may be chastised for not to blaspheme . They threw away their conscience , therefore , " are transferred " their spirit to others if one opens up for the same demonic and evil influences. King Saul was never circumcised heart - although he came under prophesied. 1 Sam . 19 19 When Saul was told that David was in Naioth in Ramah, 20 Saul sent messengers to take David: and when they saw prophetic crowd, which was prophesied , and Samuel standing there as their lead , then came the Spirit of God Saul's messengers , and they also prophesied . 21 When it was told Saul , he sent other messengers, and they also prophesied . And Saul sent messengers again the third time, and they also prophesied . 22 Then went he also to Ramah , and came to a great well that is in Secu , he said, Where are Samuel and David? They answered : They are Naioth in Ramah. 23 And he went thither to Naioth in Ramah: and the Spirit of God was upon him also , so he went all the way and prophesied , until he came to Naioth in Ramah. 24 When he tore off his clothes and he also was prophesied as he stood before Samuel , and he fell down and lay naked all that day and all that night Wherefore they say, Is Saul also among the prophets ? Emanuel Minos , David Ostby , Jan Hanvold , Benny Hinn , Todd Bentley and all other Pentecostal Charismatics are like King Saul . They know both the one and the other, but Jesus knows they do not even Jesus does not know them! It is obvious that this is so, then the demons can not stay in the heart of a true child of God. Whether " live " Satan or God there. It is obvious that when having people who are true children of God, but is that the religious time of Jesus , Satan's child and have him Father . Joh 8:44 Ye are of your father the devil , and you want to do your father's desires he was a murderer from the beginning, and abode not in the truth, because truth is not in him . When he speaketh a lie, he speaketh of his own: for he is a liar and the father of lies . After studying this subject, and the word of God again , so I have come more and more to the conclusion that these deceivers , sorcerers and false prophet have never been saved and has always belonged to the evil as he is their father .